Work with a motivational keynote speaker guaranteed to Engage, Excite and Empower! Mimi Brown does not disappoint when delivering a motivating keynote. A business owner, two-time beauty queen, DJ, and Contestant on NBC’s Biggest Loser, Mimi is able to instantly connect to listeners through her personal story. She draws the audience in with powerful, entertaining and insightful truths and actionable steps that equip and inspire. You will come away laughing and with real steps to overcome obstacles and fear, while commanding confidence to turn negative situations into the positive accomplishment of your goals. We all know someone who is a “born leader”, that person who, as long as anyone has known them, has that something special which makes them stand out and be followed. Sure, there are proven strategies and techniques that work for leaders, even if they don’t have that something special. But there is also a way for you and your employees to actually develop your own something special and then use it to create a whole new level of success. So while there are countless resources for developing leadership and sales teams, there is only one Mimi Brown. Engaging. Funny. Real. Effective. Find out how she can teach and inspire your team members to become the trusted leaders who are followed, regardless of their position or title, but for their newfound ability to consistently connect, effectively motivate and appropriately empower those they wish to influence. Synonyms for “leadership” include: guidance, direction, control, management, supervision, organization, and government. Mimi Brown teaches about different kinds of influence and how to exercise your greatest influence to increase business AND employee satisfaction at the same time . UP the volume on getting results you want in life. The power to change your life is within your reach. 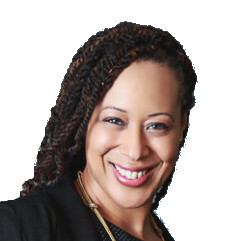 With Mimi Brown, learn how to access that power. There is a secret on how to create your own reality. Access your greatest source for connecting your current reality with your desired dreams. Tap into the power of intention and focus during Mimi’s jammed pack session. This dynamic and interactive presentation includes practical exercises that inspire and motivate participants to live the fulfilling the life they want. Discover the power of your thoughts, words and intentions, along with the path to taking action. Realign your thoughts and beliefs with your highest intentions. Explore and use the four key steps to accelerating your personal success. Discover your personal path of least resistance to your greatest well-being and success in ANY given moment. Music is a universal language that brings people together. What do you think of when asked to recall a time when you felt pumped up and inspired? What song comes to mind? Our connection to music is undeniably magnetic; it connects, inspires and reminds us of our purpose, power, and potential. Exceptional leaders strive to do the same: to encourage, empower, and move people just like the melody of your favorite song. • The practical leadership lessons embedded in music and how to apply them to their personal leadership philosophy. From Mozart To Motown, Hip Hop To Heavy Metal, and Disco To Pop, Mimi uses a vast array of musical genres to illustrate the link between music and leadership. Combining her 20-year career as a professional DJ along with her in-depth experience as a Fortune 500 leadership development expert. Mimi creates a show stopping experience by integrating a mix of music, humor and practical leadership insights to create an AMPED up experience for the entire audience. 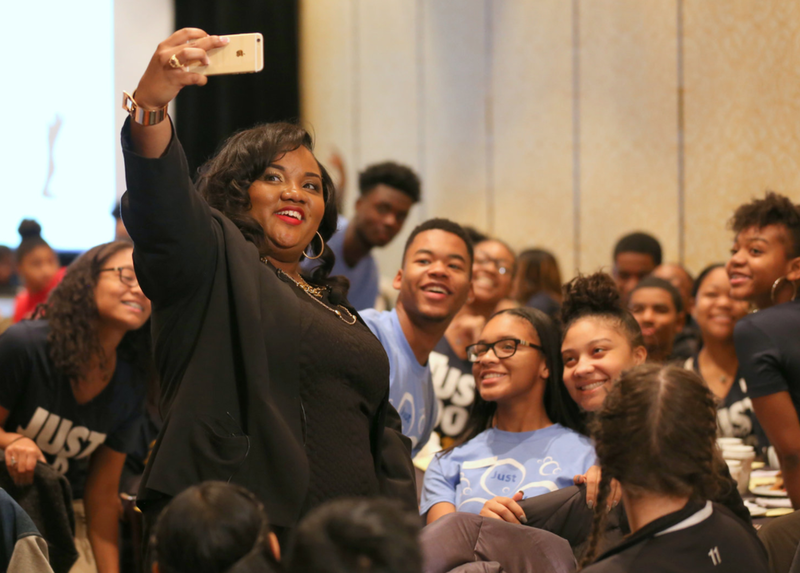 Mimi taking a selfie break during her keynote with students during the Michigan Associations of Student Councils and Honor Societies conference. 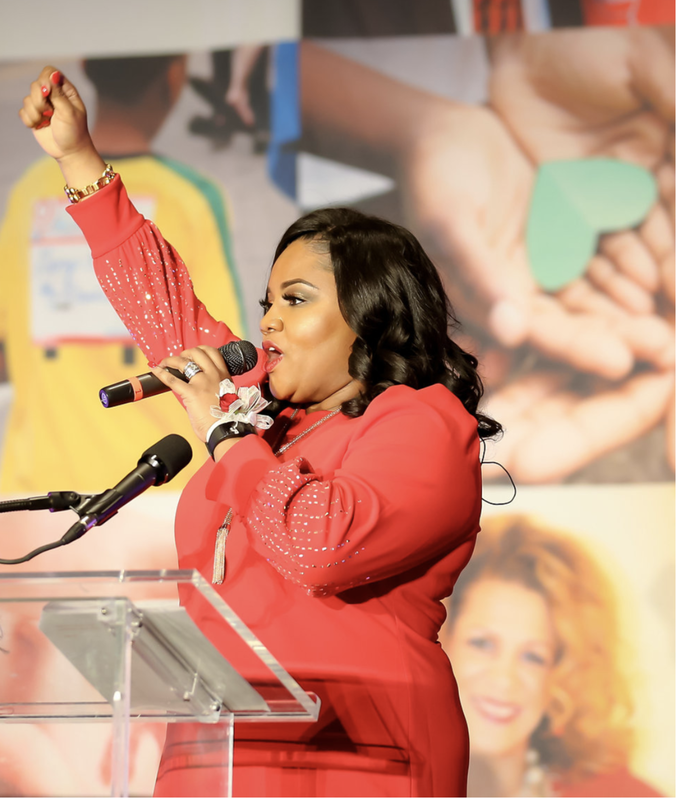 "The amazing Mimi Brown, as she is now known at our organization, spoke at the Friedman Real Estate Summer Leadership Conference and lit our entire team on fire with her dynamic presence and immeasurable energy. Her Keynote presentation on the 3 E’s of Exceptional Leadership, and Breakout Session on Communicating with Influence was on-point as it recharged our leaders and encouraged everyone to engage, expand and empower one another. If you are looking for someone who can make an impact, excite your team, and enliven your event, Mimi is the one to call. She exceeded our expectations, and her professionalism was second to none. Thank you Mimi for making our event so memorable!"